Today is the big day! I am officially 30 years old. Happy Birthday to me!!! I don't actually have anything wild or crazy planned for the day itself, which is pretty much exactly what I want (I'm boring like that). I am celebrating though — with a ton of food, of course. Erlend and I have a reservation at Momofuku Ko for dinner tonight, and I am treating myself by taking the day off work (even though I actually can't afford it), picking up my pre-ordered strawberry lemon verbena cronuts from Dominique Ansel Bakery, and having a junky burger and soft serve lunch with some friends on the rooftop garden of The William Vale (provided we don't get rained out — how come nobody ever told me that New York City is very, very rainy?). Now I'm not usually one to assign much significance to birthdays, but 30 is a milestone. Mostly, I'm glad to be saying goodbye to my 20s — like everybody's, they were a time of uncertainty. I spent several years bouncing between cities and jobs, losing/gaining various friendships, and of course, baking my little heart out on this blog. And if I'm being honest, my twenties were marked by making compromises in the pursuit of, well... I'm not sure what exactly. My career, as crass and unromantic as it is to admit this, seems like the obvious answer — there was a lot of reluctantly leaving home for better job opportunities, painstakingly embarking on long distance relationships for higher salaries, and downplaying the importance of this blog for alleged financial security and health insurance. But at the same time (and mostly through this space), I was meeting women whose work stood in sharp contrast to my own. They were defining their own paths and creating ventures with pursuits more meaningful to me than a random company's revenue: the lady who spent three years building a book store dedicated to food in Greenpoint, the lady who hosted a Filipino food pop-up in all fifty of the United States, and the countless others whose hard work and creativity are a constant source of inspiration. My goal for my 30s is to be one of these women that I've spent the last few years admiring and learning from, as well as to spend the decade pursuing what is meaningful and valuable to me. If my 20s were all about climbing vague and perpetually shifting ladders, my 30s will be about changing the game entirely. I want to be more passionate about what I'm spending the majority of my waking hours on, to be my own boss, and to stop chasing the highest paycheck. I want there to be less compromises and tradeoffs between my financial security and my mental health. It's lofty, I know, but I have a much clearer idea of what I want, and more confidence in my abilities to go for it, too. And now, this cake. For my 30th birthday, I wanted to go "classy". 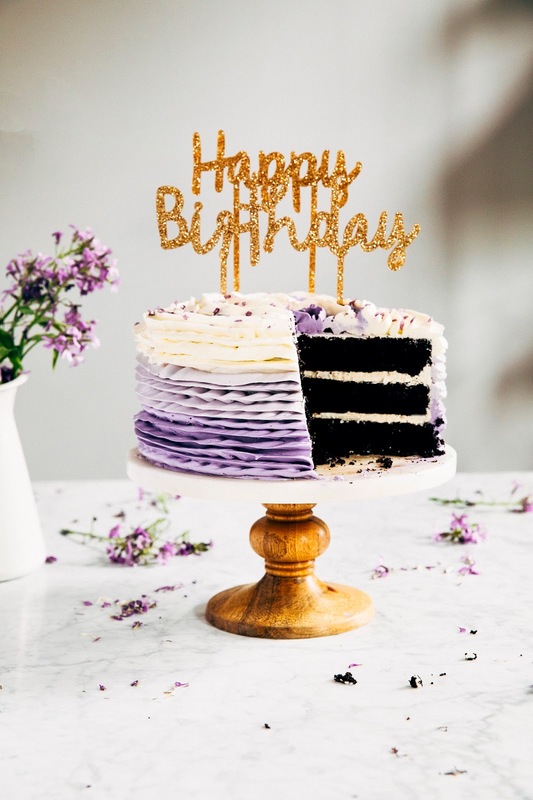 To me, the components of this cake are more elegant than my usual style — chocolate, lavender, Swiss meringue buttercream, and the world's fanciest purple sprinkles (candied violet petals, purchased during my trip to Copenhagen last summer). The chocolate cake is from my friend Jessica's cookbook, The Baker's Appendix. It's a solid chocolate cake, dark with chocolate and a crumb sturdier than my loose, light-as-air-but-sorta-difficult-to-frost default recipe. The Swiss meringue buttercream is adapted from a Stella Parks recipe from Serious Eats; despite giving me what I was convinced was a second degree burn (more on that later), her recipe makes a dream of a frosting — less waxy and greasy than most Swiss meringue buttercream recipes, and the best kind of solid-yet-silky-and-soft texture for piping. Don't be fooled by the elaborate piping job; with a petal piping tip and a rotating cake stand, all those ruffles only took about 15 minutes. Lavender extract is available online; I used this small batch brand from Oregon. Be careful not to confuse it with lavender oil, some of which is not culinary grade and is meant for beauty and health purposes. For me, a little lavender goes a long way — too much can leave your cake tasting like soap. 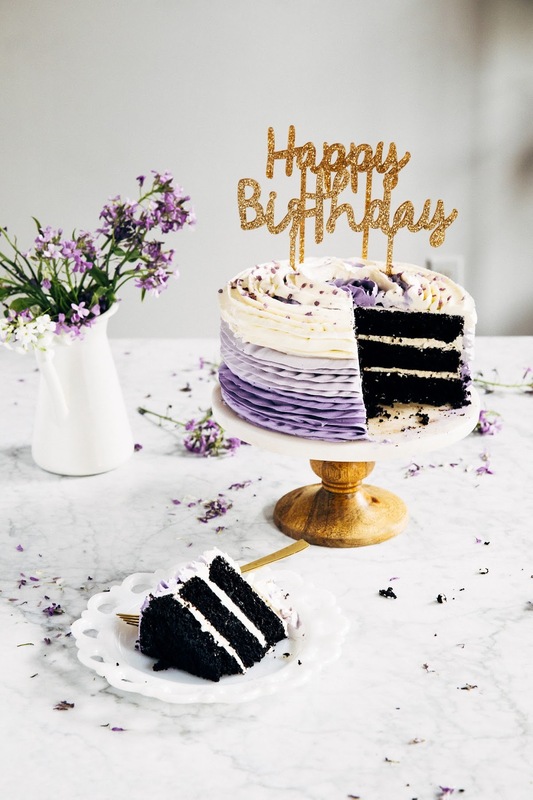 I used just enough to give the frosting a hint of lavender aroma and nothing more; if you find that the flavor is too subtle, increase the extract by 1/4 teaspoon at a time until you get to your desired level of flavor. To frost the ruffles, you need a petal piping tip (I used #104) and a rotating cake stand. It works best if you've frosted the cake with a light crumb coat first; if going for an ombre effect like my cake, it will make your life easier if your the frosting on your crumb coat corresponds to where you'll pipe the ruffles (otherwise, you'll have weird patches of color between each ruffle layer that will stick out unless you are super meticulous with the piping). 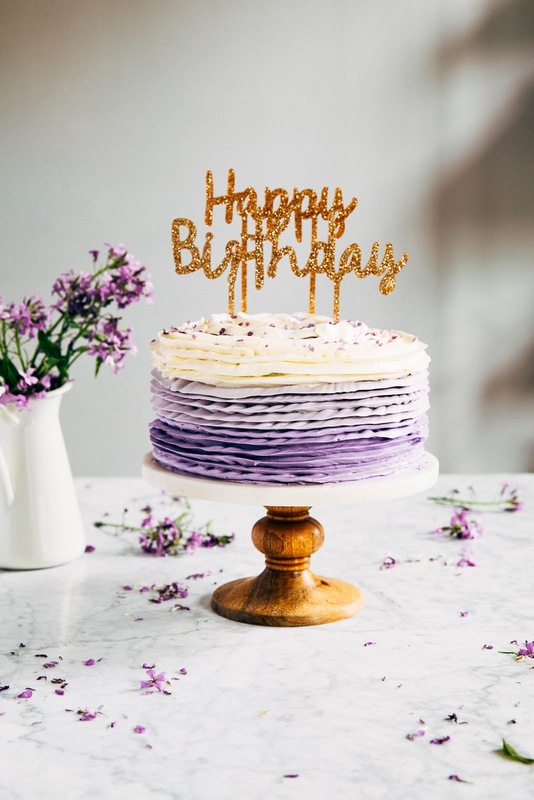 Start at the top of the cake and hold your piping bag at a slight angle with the "fatter" end of the petal tip closer to the cake, and with even pressure, squeeze the frosting onto the cake while rotating the cake on its stand to create a ruffle that goes around the whole cake — check out this YouTube video for a great visual aid. This recipe errs on the side of a LOT of frosting; if you're not piping ruffles, I suggest cutting down the ingredients by half to make a smaller batch of buttercream. Swiss meringue buttercream is much fussier than American buttercream and requires some of its components to be cooked before being whipping into oblivion. The original recipe instructs you to cook egg whites and sugar in the metal bowl of a freestanding electric mixer, which I initially did but then gave myself a severe burn when absentmindedly grabbing the handle to position it back into the mixer. I've modified the steps in my recipe by instructing you to cook the ingredients in a homemade double boiler instead — hopefully this saves the skin on your hands! Center a rack in the oven and preheat to 350 (F). Prepare three 8-inch cake pans by spraying generously with cooking spray and lining the bottoms with a parchment paper circle round; spray the parchment paper as well and set aside. In a medium bowl, whisk together 2 cups all-purpose flour, 3/4 cup Dutch-processed cocoa powder, 2 teaspoons baking soda, 2 teaspoons espresso powder, and 1 teaspoon kosher salt. Set aside. In a large bowl, whisk together 1 cup sour cream, 2 teaspoons pure vanilla extract, 1/2 cup canola oil, 1 1/2 cups tightly packed dark brown sugar, 1/2 cup granulated sugar and 2 large eggs until very well combined. Sprinkle the dry ingredients (from the 2nd step) over the wet ingredients (from the 3rd step) and whisk until the dry ingredients are just incorporated into the wet ingredients — don't worry about any lumps or streaks of dry ingredients at this point. Whisk in 1 cup boiling water, 1/4 cup at a time, until all of the water is incorporated and you have a nice, smooth batter — the batter will be a little thin, but that's okay. Divide the batter evenly between the prepared pans. 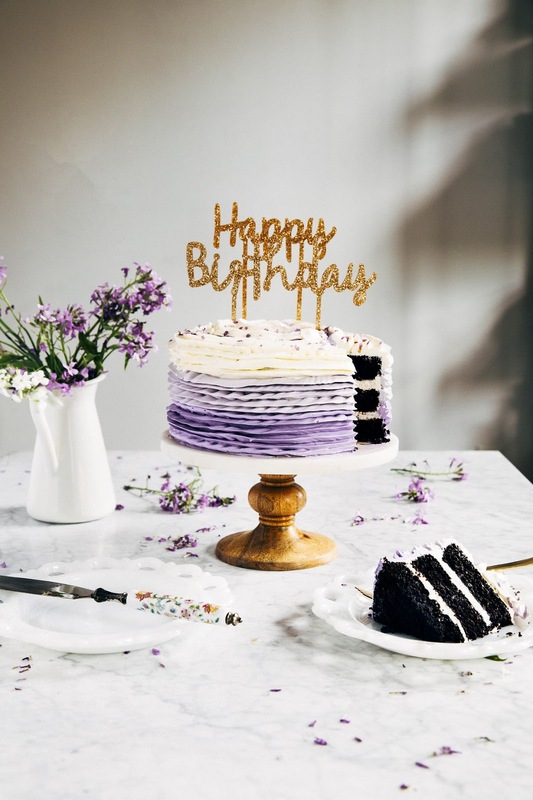 Bake in the preheated oven for 25 to 30 minutes, or until a toothpick inserted into the center of each cake comes out with just a few crumbs. Transfer to a wire rack and cool completely before frosting. Fill a medium sauce pot with at least 1 1/2 inches of water and place over medium-high heat until steaming hot, then adjust the temperature to maintain a gentle simmer. Combine 6 ounces egg whites, 1 2/3 cups granulated sugar, 3/4 teaspoon kosher salt, and 1/4 teaspoon cream of tartar in a medium, heatproof glass bowl and whisk to combine. Place the glass bowl over the medium sauce pot to create a homemade bain-marie, ensuring that the bottom of the glass bowl does not touch the steaming water. Fix a candy thermometer to the side of the bowl and use a rubber spatula to occasionally stir and scrape down the egg white mixture from the sides of the bowl as it warms to 185 (F). This should only take around 10 to 12 minutes, so if the mixture is moving slowly, don't be afraid to turn up the heat! Once the egg white mixture reaches 185 (F), transfer immediately to the bowl of a freestanding electric mixer fitted with a whisk attachment. Turn on the mixer to its highest setting and whip the egg whites for 10 minutes to create a glossy, stiff meringue that is cool to the touch (around 90 (F)). Once you've made the meringue, turn off the mixer and use a rubber spatula to scrape any excess meringue off the whisk attachment and back into the bowl. Swap out the whisk attachment for the paddle attachment and turn the mixer back on to a medium speed. Add 2 1/2 cups unsalted butter slowly, adding 1 or 2 tablespoons to the mixture at a time. Initially, the volume of the meringue will decrease dramatically and it will seem like the mixture is too liquidy — but as you add more butter, the mixture will thicken and cool. In the end, the buttercream should be thick, creamy, and soft but not runny. 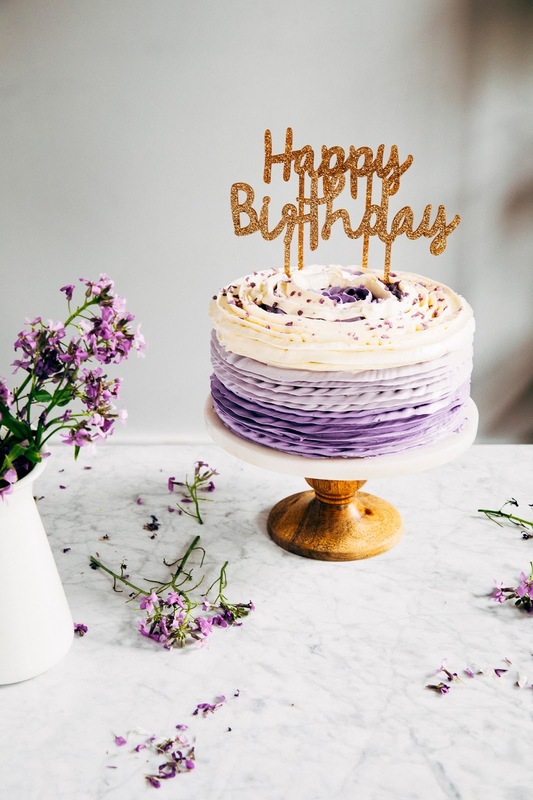 Reduce the mixer speed back to its slowest setting and add 1 teaspoon pure lavender extract, 1/4 teaspoon almond extract, and purple food coloring until the buttercream is a uniform color throughout. 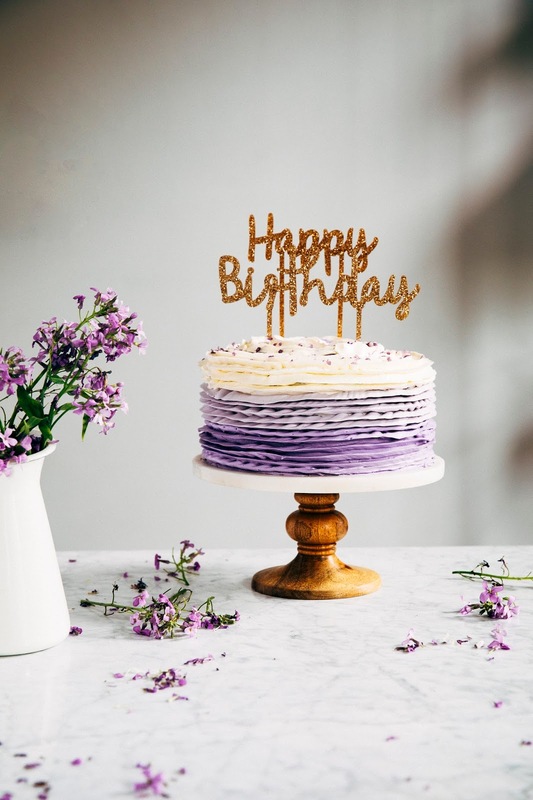 Use buttercream right away; even though the buttercream will look like it's too soft, it's actually a dream to pipe with. Unless it's a super hot day (above 85-90 (F)), there's no need to refrigerate it for it to stiffen — doing so will just make it harder to work with.